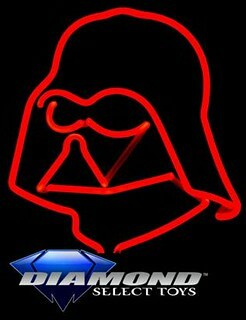 Super7 will be pulling out all the stops to make this the biggest Star Wars event in our history! Our friends in the Star Wars community will join us in providing guests, exclusive merchandise, exhibitions of rare items, prizes, and more! Read on for the details! We are proud to announce Steve Sansweet as one of our guests for MAY THE FOURTH BE WITH YOU event! Steve will be onhand to meet fans, sign autographs, and exhibit a sampling of vast contents from the legendary Rancho Obi-Wan museum. Ever want to see the original BOBA FETT blaster in person? Or samples of original EWOK fur? May The Fourth is your chance! 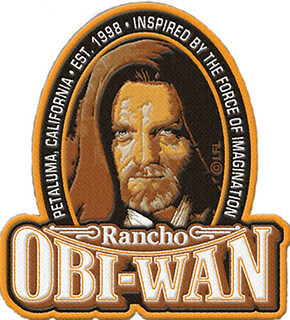 More Details on the Racho Obi-Wan offerings! 501st LEGION STORMTROOPERS IN PERSON! 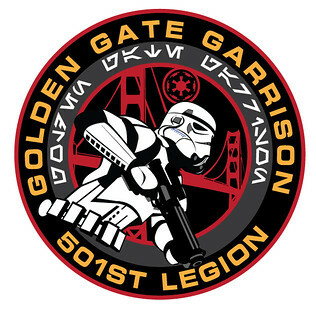 Security for Super7’s MAY THE FOURTH BE WITH YOU event will be provided by the GOLDEN GATE GARRISON of the 501st Legion. “Real life” Stormtroopers will be in-person, posing for photos, playing games against fans, and keeping an eye out for a few particular droids. Take a photo with a TK in front of Super7’s famous flocked Star Wars Wallpaper! 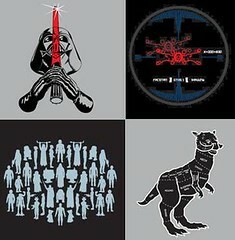 FOUR NEW SHIRTS DEBUT FOR MAY THE FOURTH! Four brand-new Designer T-Shirts have been added to the Star Wars X Super7 Collection, and will debut available at the MAY THE FOURTH BE WITH YOU event! Each is designed and exclusively retailed by Super7, under authorization from our friends at Lucasfilm. ACME ARCHIVES is bringing a massive exhibit of original paintings from BRIAN ROOD as well as a wide selection selection of Star Wars prints from a variety of artists. Screen prints, canvas originals, and framed pieces all will be available — the largest authorized Star Wars art show in San Francisco in years! Click here to see a sampling of the fantastic pieces ACME will be bringing to Super7! If you would like to pick up your print during the MAY THE 4TH event, please select “HOLD FOR PICK UP” when checking out. Collectors can bring their STAR WARS toys & collectibles to swap with one another. Meet your fellow fans from REBELSCUM.COM and trade some toys! Bring your Kenner treasures and trade all day long, with the official swap meet starting at at 3pm. If you don’t have something to trade, don’t worry. Super7’s selection of Vintage Star Wars toys will be on sale for 20% off the marked price! Now is your chance to get the loose, weaponless Dengar you’ve been dreaming about! 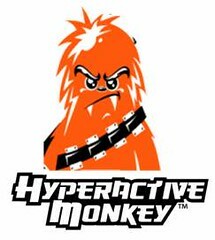 Hyper-talented Jerome Lu from Hyperactive Monkey will create a wall mural painting live on site throughout the day! Witness a gigantic Star Wars collage as it develops! Calling all collectors! 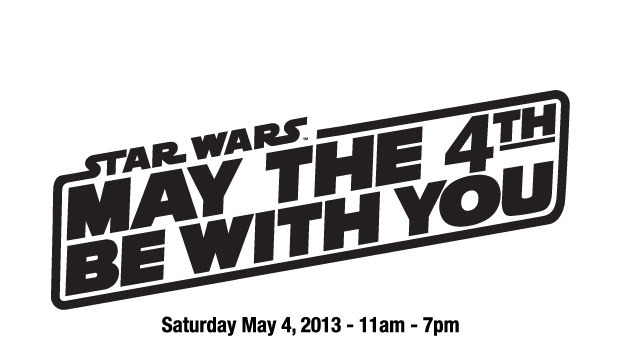 Super7 will be joined on May The Fourth by some the very best manufacturers of Star Wars merchandise. Come see the display of prototypes for future Star Wars releases from Diamond Select Toys – such as a CARBONITE HAN SOLO vinyl bank and more! 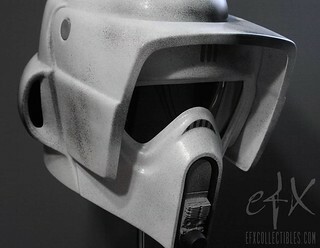 eFX Collectibles are the geniuses who create the life-size prop replica lightsabers, helmets, and studio scale vehicles. What do they have coming up next? Visit us on MAY THE FOURTH and see an exhibit of EFX prototypes, including the highly anticipated BIKER SCOUT HELMET! 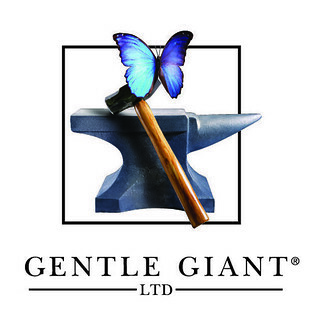 The digital pioneers from Gentle Giant LTD will provide a selection of Star Wars prototypes as well as brand new merchandise for display. Get the lowdown on what is coming up next in the 12″ Kenner Figure Series, Mini-Bust line, and more! Plus stop by the Super7 store for your chance to win Gentle Giant PRIZES such as Gift Cards and Jumbo Figures! Super7 is happy to welcome MIMOCO as a participant in our MAY THE FOURTH BE WITH YOU Star Wars Day mega-event! 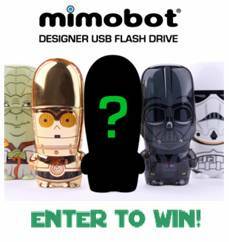 Attendees can enter to win a new “mystery character” Mimobot 32gb USB Flash Drive! The identity of the character will be unveiled on May The Fourth as part of a Limited Edition of only 1000 hand-numbered units, created Exclusively for Star Wars Day 2013! Entry forms are free – no purchase necessary – and are will be available exclusively in-store starting at 11am. Drawing for the winner will take place at 6pm. Odds of winning is dependent upon number of entries. 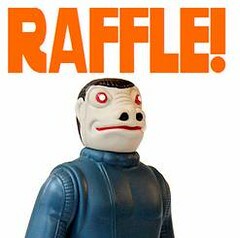 If that isn’t enough, we will hold a raffle to win a rare vintage Blue Snaggletooth Kenner action figure! The figure is loose but complete with its blaster, and is waiting to join the other space-freaks at the creature cantina on your toy shelf. Due to the rarity, this sought-after figure is valued at $160~200, but you have a shot at winning the raffle for only One Dollar! Raffle tickets are only $1 each and will be available exclusively in-store starting at 11am. Drawing for the winner will take place at 6pm. Odds of winning is dependent upon number of entries. Star Wars © 2013 Lucasfilm Ltd. & TM. All rights reserved. Used under authorization. TOMORROW IS MAY THE 4TH BE WITH YOU!